Sat outside in the rear patio area early last night with a pint of Ringwood Razorback which went down pretty easily. 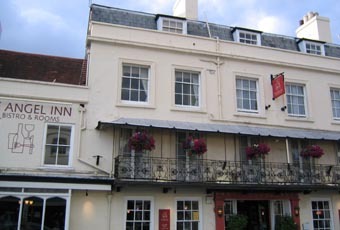 The patio is a little strange in that it is basically part of a shopping courtyard but it offers a fascinating architectural view of the rear of what is apparently the oldest pub in Lymington with its numerous extensions and additions. Another pub in Lymington that warrants a revisit some day. 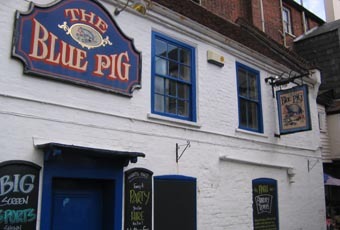 Now called The Angel & Blue PIg Inn, several Beers available but I went for the good old Ringwood Best Bitter. Acceptable but went Flat very quickly and lacked any for of "Lacing" Not the best pint of Ringwood Best I have had , but certainly NOT the worst. Did not eat on this occasion but what I saw being served up looked appetizing. Nice Decor and a Patio Garden with many tables of assorted sizes. Will look in to see the results when back in Lymington. Now refurbished sympathetically to a good standard and although more of a restaurant serving good food at reasonable prices (�6 for a lunchtime special) there is a bar area at the rear. Service was quick and pleasant, our meals were enjoyable. I had a Hobgoblin which was very well kept. I'll be back!